Imagery is important for two major psychological processes: memory recall and problem solving. Earlier, I described Campbell's (1960) postulate of creativity, which suggests that creative people generate various solutions for problems and then select the best solution. Artists who model with clay or use oil paints can alter their artistic works and see how a variety of solutions look. But a sculptor who works in stone, such as Michelangelo, could not as easily change his stone Moses or David. Although many great artists try different solutions by making preliminary drawings and then selecting the best solution before they begin to paint or sculpt, many artists have claimed that they use imagery to help them find creative solutions for problems. Imagery allows a creator to form almost an infinite number of variations, to discard those that are inferior, to reshape those that need further work, and to retain those that meet the creator's criteria for excellence. Many scientists and artists have recognized that imagery is important for creative endeavors, and A. I. Miller summarizes many of these scientists' experiences in his book Insights of Genius (2000). For example, Max Planck, the winner of the Nobel Prize in physics in 1918 for his development of quantum theory and the law of radioactivity, suggested that creative scientists must have a vivid imagination because new ideas are generated not by deductive processes but rather by a creative imagination. In regard to creativity, Einstein suggested that imagination is more important than knowledge and that many of his ideas were products of his imagination. In this chapter I describe how the brain generates, views or inspects, and manipulates or alters images. Although I primarily discuss visual imagery, similar processes can occur in other sensory modalities. Kosslyn (1999) suggested that there is both low- and high-level vision. Whereas low-level vision uses visual input ("bottom up") to localize edges and detect motion, color, and depth, high-level vision, such as object recognition, relies in part on "top-down" processing, including the activation of stored information about the properties of objects. Imagery often aids these higher level processes. In regard to memory, imagery can be used to help store information and can be used to help retrieve information. For example, if I asked you to remember the three words slippers, elephant, and telephone, you could verbally rehearse these words or you might image an elephant wearing slippers while talking on a telephone. After you were distracted and no longer able to verbally rehearse or to image these three objects, if I asked you to recall these three objects you would be more likely to recall the objects if you imaged an elephant wearing slippers while speaking on a telephone than if you just verbally rehearsed the phonological representations of these three words. In regard to the retrieval of information, if I asked you whether the distance between New York City and Chicago was greater or less than the distance between Saint Louis and Los Angeles, to answer this question, you might generate in your mind's eye a map of the United States and estimate the relative distances between these cities. Thus, although the information about the relative distance between cities was stored in your brain, the knowledge was implicit and became explicit only after you imaged the map and compared the distance between these cities in your mental image. In regard to problem solving, imagery can be used to help solve problems that one could not easily solve using verbal reasoning. For example, a salesperson who lives in New York City has to drive to three cities, Washington, DC; Buffalo; and Chicago. If she plans to travel to the cities in that order and then return to New York City, she might not be traveling the shortest route. Hence, she might image a map of the United States and make several virtual trips in her mind's eye. She realizes if she travels to Buffalo after visiting Washington and then after visiting Buffalo travels to Chicago and back to New York, she would be partially retracing her path. She then realizes that after driving to Washington, traveling to Chicago and then to Buffalo before returning to New York City will save her many hours of driving. Just as this salesperson used imagery to help her solve a practical problem, creative people might also use imagery to solve other types of problems. Imagery might allow creative people to perform virtual experiments. Imagery can also allow creative people to "view" images of objects or processes or combinations of objects that they have never actually seen (e.g., an elephant wearing slippers while speaking on a telephone) or that might not even exist. Perhaps one of the easiest means to create such an image is to combine two or more partial images of real objects. Many of the ancient mythological creatures were created by joining two animals—such as the Chimera, which is a combination of a lion and a serpent—or by fusing a human and animal—such as the centaur, which has the head, arms, and trunk of a man and the body of a horse; the Minotaur, which combines a bull with a man; and the mermaid, which has the head, arms, and trunk of a woman and the tail of a fish. If you want to create an image of a monster for a movie you could use your imagery to join a flying bird with a head of a rabid wild boar whose mouth is foaming and who has the prehensile tail of a new world monkey. Imagery might allow you to morph the relationships of specific objects such that the teeth of this flying rabid boar are razor sharp and contain barbs. 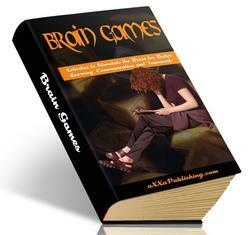 A Fantastic Treasury of Mind Bending Puzzles, Games, and Experiments for All the Family. If you are one of those people who takes great pleasure in playing games, and also happens to be extremely competitive, you know how frustrating it can be to fail at solving a game or puzzle.